We are all aware of the importance of caring for our physical body; eating well, sleeping enough, exercising etc. Most of us are increasingly aware of the importance of caring for our emotional self, but how may of us understand how to care for our energetic self. How many of us even know we have an energetic self? As an energy healer I am more aware than most of the energetic level that we exist on. I have always been able to sense things that others seemed to be unaware of, but this became even more apparent when I completed my Reiki training in order to keep myself well after my brain surgery in 2007. At this point I really began to understand what it was I had been tuning into. We have energy which we take in as food and release as movement, breathing, etc, but we also have a more subtle energy system. This diagram gives you an incredibly simple version of our energy structure. 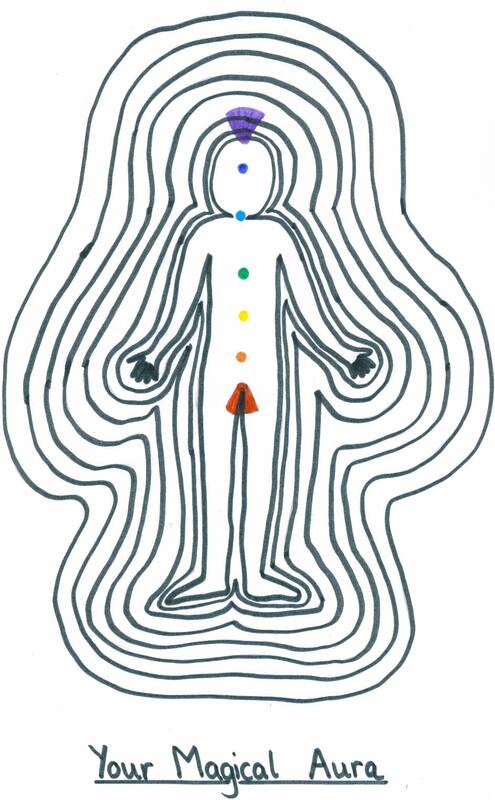 We have seven chakras, which run through the centre of our bodies and a complex, layered aura which is our external energy system. It is this energy which we detect with out even really being aware of it when we first meet someone and we instantly like or dislike them. It can tell us much more than that though. It is our own energy system which detects when others are feeling tired/happy/angry/frustrated and also how we pick up on an atmosphere in a room or building. Most of us use this incredibly complex energetic structure all day every day and we never even realise. It would take much more than a quick blog to teach your about the workings of your energy system, and I couldn’t teach you all about it any way because there are so many intricacies that I don’t understand. What I can do though is to teach you to look after it, using a couple of very simple techniques. There are two very simple techniques which I use to keep my energy system healthy and clean, yes you have to keep it clean! The first thing I do is to protect my energy. Why do I need to protect my energy? Well, I am very sensitive to energy so if I pick up other people’s energy or they take too much of mine, it can affect me quite dramatically. The same is true for you, but you may not have realised that that is what is causing your symptoms. Perhaps they were having a difficult time or had been ill? Chances are they were unknowingly draining your energy. Often with loved ones they don’t even have to take it, we give it freely. But it can leave us feeling tired. What can we do to help protect our energy? One thing we can do is to put on a suit of armour. We are going to put on a very special suit of armour. Your armour is going to protect you from energy. When someone is feeling sad, angry or tired they can make us feel sad, angry or tired if we spend time with them so it is important to put on our energy armour every morning so that we can feel happy all the time, no matter how everyone else is feeling. Ok we are going to imagine that we are pulling on some very strong very thick trousers, as we pull them on imagine that they are going to keep all your happiness and love inside and not let anything sad or angry get to you. Once you have put on your trousers, pull on your boots and grab your top. As you put on your top imagine that this is protecting your heart and your stomach from all those sad feelings that you get sometimes. Pull on your gloves, and find your protective helmet. Once you have put on your helmet you are completely protected from other people’s feelings which might make you feel sad or upset. We’re going to just do the final preparation. Ok, close your eyes and think about how strong your armour is. Nothing can get through your armour. Anything that touches your armour is immediately turned into love and bounces back off the armour. If you feel sad or angry while you are wearing your magical suit of armour don’t worry, the sad feelings can get out. Negative feelings can only leave the armour, they can’t get in but happy, loving feelings can move through the armour in any direction and make everyone feel happy. You are now completely safe and ready for battle). It may seem silly at first but simply performing an energy protection ritual can make a huge difference. You don’t have to use armour, you can protect yourself in a bubble, a pyramid, even a jelly baby. We long as you set your intention that nothing negative can get out and your energy will be protected it will be. You may read some people suggesting that you create a mirrored surface and bounce any negativity back to the person who sent it. Please don’t do that. I always set my intention that anything that isn’t able to get through my energy shield is turned into love and bounced back. There is enough negativity in the world. Now when you have to go to the supermarket or a shopping centre and you are surrounded by stressed parents shouting at their children and impatient adults whose only thought is what they need to get done, you won’t be affected by their negativity, it will just bounce off you instead of clinging to your energy system and making you feel tired or angry too. In my next blog I will explain how easy it is to cleanse your energy system and teach you some simple energy healing techniques to help you strengthen your energy.